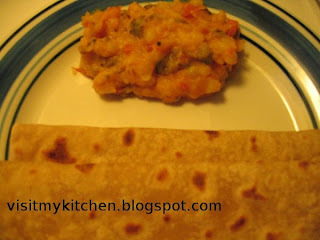 This is one recipe I usually end up when I want to make a quick side dish for rotis. Wash well, grate the skin, chop the potatoes into cubes. In a spoon of oil, temper the mentioned ingredients. Add chopped onions, saute till translucent. Add chopped tomatoes cook covered till tomatoes are mashed. Add 2 cups of water, add red chilli powder, sambar powder, mix well. Add chopped potatoes and cook covered. Once potatoes are boiled, add salt and mix well and garnish with coriander. ** Adding of potatoes will generally thicken the subzi by itself. If required, add a spoon of rice flour/corn flour/gram flour mixed in cold water to thicken. ** Based on choice this could be made as spicy curry or a mild one. thats a yummy recipe..best to make when you are in a hurry..quick and tasty.. Ohh!! My favorite curry..looking great..
quick and also tasty receipe. my husband loves it.